Showdowns Conclusion - We showed this mare as a yearling and a little as a two year old. 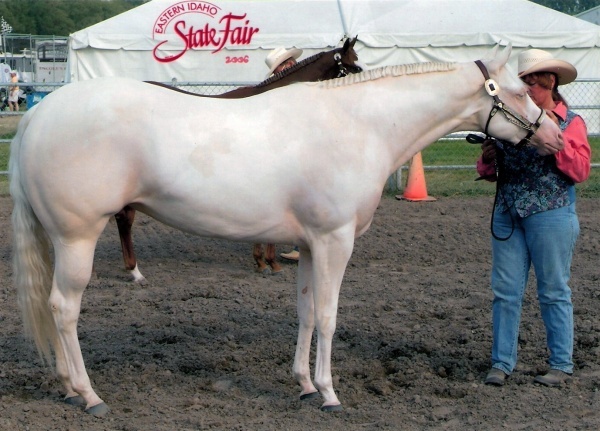 She has Grands and Reserves and she was High-Point Yearling Mare in the E.I.P.H.C., and High-Point Halter Mare as a yearling. She was also High-Point 2-yr. Old Mare in the E.I.P.H.C. and High-Point 2-yr. Old and Halter Mare in Montana. She has earned her ROM. She has a gorgeous head and very pretty everywhere. She is a loud colored overo cremello. She is in foal to Ultimately Acoolest for 2014.